The Department of Agriculture (DA) will soon launch a new mobile phone application, FARMHELP, which would enable farmers, fisher folks and other agriculture stakeholders to forward their concerns and submit complaints to the DA 24 hours every day and seven days a week. FARMHELP, designed by the group PureForce which also designed the 911 and the 8888 programs of the administration of President Rody Duterte, will be one of the two important information technology projects of the DA which will provide farmers and fishermen access to information and assistance. On March 7, 2017, President Duterte launched in ceremonies in Malacañang the National Color-Coded Guide Map which gives farmers and fishermen access to important information like what specific crops to plant in their area and weather advisories. It is now accessible on line through the link www.farmersguidemap.gov.ph. 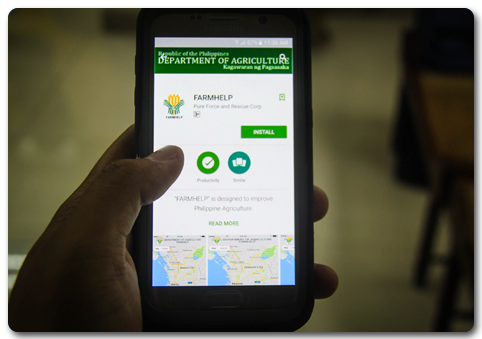 The mobile phone app FARMHELP was introduced by the DA to the public as early as August 2016 as another technology modernization program which was developed with inputs from the Department. Just like other procurements of the Department, however, the acquisition of the technology, including Android mobile phones which will be distributed to farmers' organisations nationwide, had to go through the usual rigorous process and one failed bidding. The technology, including the android smart phones which will be given to farmers and fishermen's organizations all over the country and the operation of a 24/7 answering desk similar to the operations of 911, was acquired by the DA at a bidded price of a little less than P30-M. Using a smart phone, the user could just go to the Apps and he would find FARMHELP which he could tap to download the application. Once downloaded, the user could start following instructions which would be shown in the phone screen. He could tap the name of an office if his concerns are with a specific bureau, corporation or attached agencies under the Dept. of Agriculture. For example, a farmer who would like to request for a technical information on a disease affecting his fruit trees, could simply take a photo of the diseased plant and send it to the Bureau of Plant Industry (BPI). The information will immediately be forwarded to the BPI by the 24/7 answering desk as soon as the offices open the following morning. In cases of extreme emergency, the user could use SMS messaging or call a Hotline which would be indicated once the FARMHELP phone application is downloaded. Damage to crops or vital farm infrastructures like roads or bridges could be easily responded to. The phone application will also warn farmers and fisher folks of incoming typhoons or weather disturbances and provide information on when rains are expected. It would also give fisher folks an advisory when it is not safe to go out to sea to fish. The FARMHELP apps will be able to pinpoint the exact location of the user at the time the message is received, thus providing a faster system to extend help immediately. The DA Secretary will also be able to monitor the whereabouts of all the Undersecretaries, Bureau Directors and Regional Directors of the DA because each will be given a special phone which could be tracked. Starting September this year, DA technical teams will start a nation-wide information campaign to instruct farmer-leaders on how to use the phone application. Each farmers' association and cooperative will also be provided with a low-cost smart phone which they could use to forward the concerns of their association or cooperative. FARMHELP is the first smart phone application which the DA will be using to give farmers, fisher folks and agriculture stakeholders greater access to the department. It is also expected to improve transparency and accountability in the Dept. of Agriculture.